Hot dip is a MUST for cold weather parties. This recipe can be made ahead and frozen for up to 3 weeks. Just bake from frozen and serve. EASY holiday entertaining! Yes, I got too excited eating it to photograph it. Heat until bubbly. For a saltier and creamier dish, add back some of the reserved artichoke brine. For a tangier dish, use brine from a jar of banana peppers or jalapeno peppers. Kick up the heat with a 4 oz jar of chopped jalapenos. Transfer to a serving dish or a freezer-safe container. Serve immediately or store. To reheat from frozen, place frozen dip into an oven-safe dish and cover with a lid or foil. Heat at 375 for about 30 minutes, stirring half way through. This dip can be reheated at any temperature to suit the other dishes that might be baking for your holiday party. Serve with pita chips, tortilla chips, sourdough bread, veggie sticks, etc. Makes a great spread on sandwiches to jazz up left-over turkey. This recipes is rooted at a little gourmet foods and cookware shop I worked at while in high school. I recreated a version of the dish with Eli’s mom’s raspberry preserves. Big hit. And Eli, gonna need more of those preserves pal. 2 cans organic black beans, drained and rinsed. 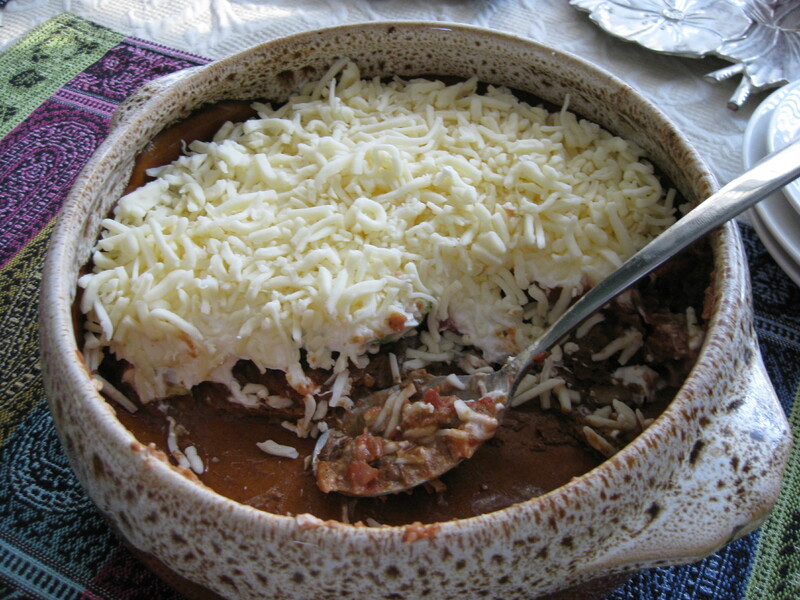 Layer in a 9 x 13 baking dish: onion, beans, and cream cheese. Pop the cream cheese in the freezer for a few hours to make it easier to slice. Mix up the raspberry chipotle salsa in a separate bowl: If you can’t find a pre-made chipotle salsa that you like, a salsa can be made from a 12 oz jar of a salsa you like. Simply add 3 diced chipotle peppers (seeds removed!) and a tsp of the adobo sauce chipotle peppers are packed in. Whisk the preserves into the salsa. Pour the raspberry chipotle salsa mixture over the cream cheese layer. Top with shredded pepper jack cheese. You’ll need at least 2 Cups of pepper jack to cover the dip. Do not use over 3 Cups of pepper jack as it will over power the other flavors. Bake at 375 F for 20 minutes until bubbly. Serve hot with blue corn tortilla chips. 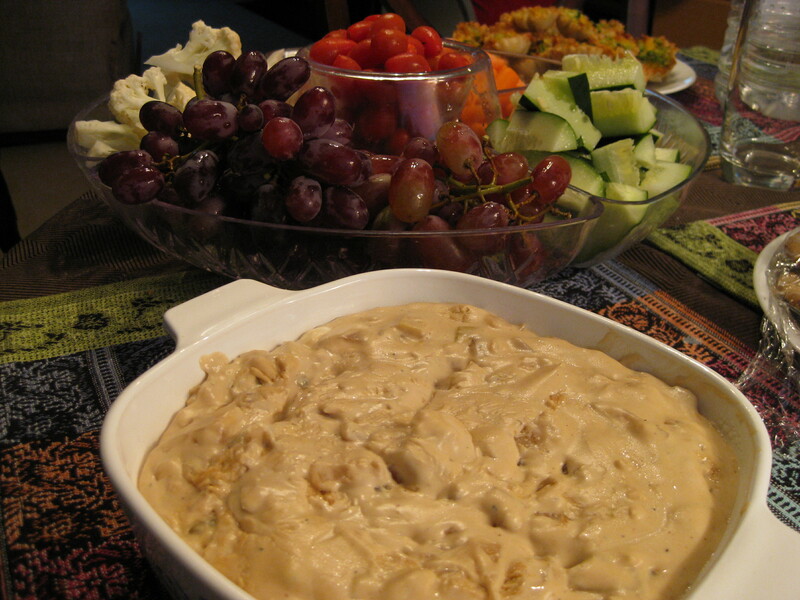 This dip can be assembled ahead of time and frozen for up to 3 weeks. Just heat and serve!